There seems to be a misconception about the impact of dry tailings to air quality. Officials want to use the same statistics of dust particles off a wet tailings compound; this is not valid. 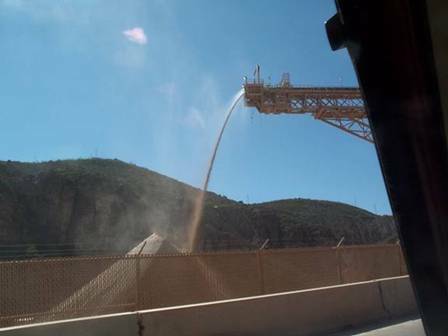 Dust flying off dry tailings and dust flying off wet tailings are not comparable. Dry tailings impoundments exist in two isolated places with no dust data available—but we do have an example in Sahuarita , AZ (documented below). Even so, the content of the bedrock would have to be calculated to determine the type and quantity of heavy metals in the pulverized waste slurry that goes to the dry tailings. Tailing Impoundments will be designed with a composite liner consisting of single geomembrane of at least 30 mil thickness (60 mil if HDPE) over, a minimum, twelve inches (placed in two 6-inch lifts) of 3/8 inch minus native or natural materials compacted to achieve a saturated hydraulic conductivity of no greater than 10-6 cm/sec. This is typically achieved by compacting to over 90% maximum dry density (standard Proctor; ASTM Method D-698) within 3% of the optimum moisture content. The compacted low permeability soil surface should be finished flat and smooth (e.g., by rolling) and inspected prior to geosynthetic installation to remove protruding particles, if present. In areas exposed to the sun, the geomembrane must be certified UV resistant. Geomembranes are to be selected based on a compatibility analysis using an evaluation of the liner composition and thickness, chemical compatibility, height of the tailing pile and foundation characteristics. The geomembrane is to be secured in an engineered anchor trench. The anchor trench is to be at least two feet deep and two feet wide. The geomembrane must extend across the bottom of the trench and at least one foot up the outside trench wall. The anchor trench backfill must consist of minus 1/2 inch material compacted in 6-inch lifts at 95% of maximum dry density according to the standard Proctor compaction effort (ASTM Method D698)….. In August, 2012, I wrote Henry Darwin (via his secretary) asking for a clarification on this discrepancy. However, he did not take the time to reply.
. . . I cannot comprehend how Rosemont is being exempt from having a liner on their tailings impoundment--even though it is mixed with waste rock, bedrock--the heavy metals will still be there. I had asked this question before to ADEQ water staff without getting clear answers. The situation was red-flagged again because in our quarterly CAG meeting with Freeport McMoran last week we were discussing the prospects of their new tailing impoundment. I questioned specifically, "Will this new impoundment be lined?" The FMI rep assured all of us that it will be double-lined according to BADCAT regs. So why don't these BADCAT regs apply to Rosemont? The over-seeing officials can't have it both ways—failing to regulate the heavy metals from both avenues of release to the environment. They seem to opine that the heavy metals will not sink into the groundwater and will not be released into the air by the regular 50-mile an hour winds in the Santa Ritas. Having witnessed many dust events off tailings impoundments, I question, by what magic will this anomaly occur? The big question is “will Rosemont operations affect the health of the inhabitants (including wildlife) of the region?” I will give information below to show that the dust off the dry tailings will impact the safety on the nearby Highway 83, and that dust will be carrying toxic metals that will be harmful to the residents or recreationists in the area. Further, the dust will be carrying the Valley Fever fungus, which is prevalent in this region. It is particularly a danger to out-of-state visitors since when they return home and fall ill, the physicians have no experience to be able to diagnose the illness. The present dust levels at the Rosemont do not give a true picture of the future scenario. The mine will be creating a moonscape of 3,000 acres: 1,500 acres of waste rock and another 1,500 acres of dry tailings at variable heights reaching some 800'. In other words, it will be a process that brings fresh layers daily to contribute to fugitive dust. So dust events cannot be calculated using the tailings surface, but must be calculated at 1,500 acre surface x 21 years x 365 days. The mining operations will remove all vegetation, including 33,000 mature trees, which presently act to hold the soil in place and mediate the wind effects. Even the reclamation plan for revegetation requires the application of two feet of top soil and some addition of fertilizer. How will this medium be held in place from the prevailing winds? 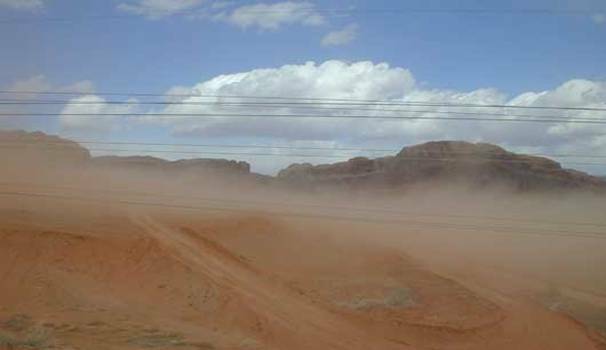 Most major dust storms in Arizona originate in Buckeye and Casa Grande, both agriculture areas where the land has been denuded, disturbed and leveled, making a perfect stage for the sweeping winds to pick up dust. Further, since the operations will be in a National Forest, so the danger of forest fires with the toxic effect of the smoke will be a continual hazard. The mining operations have already started one forest fire. In the following four sections, I will document how this mining operation will eliminate the health and safety of the residents and the tourists in that area. Massive highway accidents from dust storms are prevalent in Arizona , most prevalent in Buckeye and Casa Grande, where the land has been leveled off and moonscaped by agricultural operations. Annually there is at least one major pile-up due to wind and dust, with fatalities and critical injuries. The Rosemont DEIS states that there will be an increase in traffic accidents and deaths on SR 83 from the mining operations. Their 75 percent commuter carpool factor is simply unrealistic. It doesn't happen anywhere in U.S. and certainly not in Arizona . So we have to take the worst case scenario. When combined with increases in traffic on State Route 83 resulting from population growth, the proposed action would result in traffic increases up to 10 to 88 percent during year 1 of the construction phase (under a 75 percent commuter carpool scenario), 128 to 290 percent during year 5 of the operation phase (no carpool scenario), and 204 to 356 percent by the end of mine life (no carpool scenario). A corresponding decrease in traffic safety would occur that may result in 61 to 107 accidents per year (from current rate of roughly 30 accidents per year), with a fatality occurring between one and two times per year (from a current rate of roughly one fatality every 3 years). By applying the mitigation measure of a partial carpool during the operation phase (75 percent of worker commutes in 5-person vans), the traffic increase from mine related traffic and population growth would be 67 to 135 percent at year 5 of operations and 137 to 201 percent during year 20 of operations. Direct impacts to public health and safety associated with traffic would remain after mitigation. 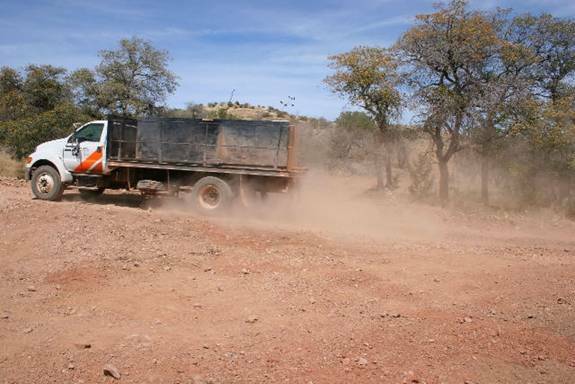 The above statistics do not factor in the element of dust storms, which are certain to increase as the mining operations continues to enlarge their tree cutting operations, replacing them with dry tailings facilities. When Rosemont Copper Company filed to have the air permit jurisdiction changed from county PDEQ to state ADEQ, the Rosemont's attorney's argument was that the release of “uncontrolled emissions for the RCP for particulate matter are greater than 75 tons/day” made it necessary for ADEQ to regulate the air quality instead of PDEQ. The RCP [Rosemont Copper Project] is a typical open pit copper mine that is planned for construction in the area generally south southeast of Tucson within Pima County . Controlled non-fugitive emissions from the mine are estimated at less than 100 tons/year for any regulated air pollutant and less than 10 tons/year of any single hazardous air pollutant (HAP) and less than 25 tons/year of any combination of HAPs. However, uncontrolled emissions from the RCP for particulate matter are greater than 75 tons/day. The RULES and REGULATIONS shall not apply to emission sources under the original jurisdiction of the Arizona Department of Health Services unless regulatory authority has been delegated to Pima County pursuant to ARS 36-1705 or 36-1706. Note that the “75 tons per day of uncontrolled contaminants” are only calculated for the truck and other mining operations, and do not include any calculation for the discharge from the tailings impoundment, which is the major avenue of discharge of contaminants to the air. 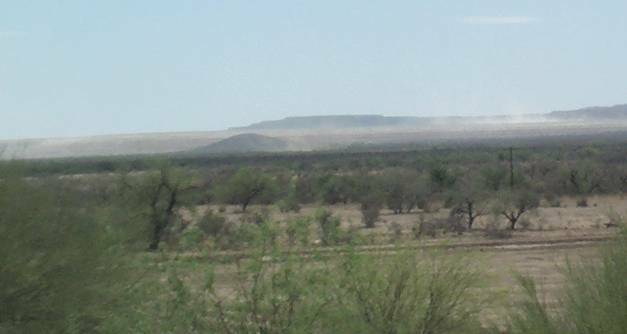 Following are examples of impact on public health by dust storms that cause fatalities and critical injuries in Arizona , using Casa Grande, with acres of disturbed, moonscaped terrain (similar to a dry tailing impoundment) near a highway, as an example. Note that the wind speeds are around 50 mph, the same wind speeds that occur regularly in the Santa Ritas. Also, take note of the tractor-trailors, equivalent to ore haul-trucks, involved in these accidents. A blinding dust storm rolled across the Arizona desert Tuesday, causing three pileups involving dozens of vehicles on a major interstate. A 70-year-old man was killed and at least 15 other people were injured, authorities said. The first two crashes occurred just after noon as a dust storm suddenly covered Interstate 10 near Picacho, about midway between Phoenix and Tucson . Those collisions involved 16 vehicles and led to the fatality. Video showed dust roiling over dozens of cars, tractor-trailers and ambulances pulled over or strewn about the highway. Authorities were unable to transport injured motorists by helicopter because of the heavy dust. The storm had traffic at a standstill along Interstate 10 south of Phoenix for most of the day. Department of Public Safety officials were fighting the blinding dust to clear numerous crashes off roadways around Casa Grande. As of Saturday evening there was still no word as to the number of crashes and the extent of injuries. 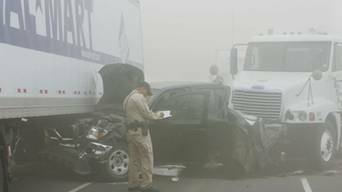 On Dec. 22, 2009, three people died in a 22-vehicle crash on Interstate 10 near Casa Grande during a dust storm. Two were local teenagers - Katie Eide, 16, and her brother Mark Zackary Eide, 14. Katie Eide was driving Mark to Dairy Queen, where he was meeting friends for a winter-break sleepover. The third victim was Edgar Ivan Medina-Vargas, 25, who was driving from Phoenix to El Paso in a pickup truck, followed by his father in a semi-trailer cab. Medina-Vargas was killed when his pickup was sandwiched between a semi-truck ahead of him and the truck driven by his father, Refugio, Department of Public Safety reports on the crash said. A must see “at the scene of the accident” video, illustrating the loss of lives and life-crippling injuries. Even wet tailings impoundments in this area of Arizona are subject to air quality violations because of blowing tailings dust. A major event occurred in 2006 in Green Valley when over 300 homes had to be cleaned of a “snow storm” of tailings dust. In 2009, the Pima County Department of Environmental Quality fined ASARCO, LLC, for air quality violations: a $100,000 civil penalty and an additional $350,000 to fund supplemental environmental projects at Canoa Ranch Conservation Park. The proof that the Canadians don't know anything about the dust reality in the Southwest occurred on November 9, 2007, when Rosemont (under assumed names) drilled a test well on Alvernon Way, in a rural residential area in Sahuarita. They were so negligent in dealing with potential dust issues that they received a violation of air quality citation from Department of Environmental Quality from digging a well! At that time, they also demonstrated their lack of transparency. When the Dept. of Environmental Quality sent a notice of violation to the registered owner of the property, Kenarco Company, it was “returned to sender.” It is common practice among mining companies to have a third party buy the lands they want for water rights/wells, so that the owners do not know they are selling to a mining company. Phelps Dodge elucidated their using this same method in their sanctioned history: Vision and Enterprise. Their lack of transparency was again illustrated when a major spill of drilling mud at a well site went unreported, then denied. It was reported to me in passing by an employee four months later. ADEQ did an investigation, but the site had been cleaned—by 50 men working all night with buckets! The point is that we cannot rely on this company to report and follow Arizona environmental regulations. In Section I of this report, the inevitability and danger of dust storms in the region and on SR 83 was elucidated. 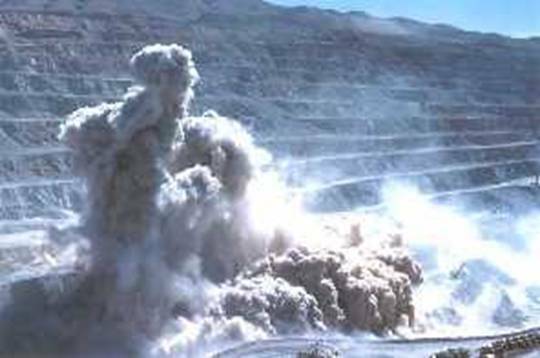 However, in the case of mining, especially dry tailings, the dust will contain toxic metals. Impoundment slurry contains milled heavy metal and uranium dust. With dry tailings, the metals will not eventually settling down to the bottom of the impoundment, as in the case of wet tailings. Therefore, the toxic metals will be on the surface and will inevitably be released to the environment during wind-dust events. We do have some data of the heavy metals that will be released from analyses available from nearby mines. Heavy metal and radionuclide content of the bedrock has not been adequately accessed for the Rosemont operations. Even though, I gave extensive information oral and written in the Rosemont Scoping Process. I am particularly concerned about radio-active material, or TENORM, as named by the EPA, it was not mentioned in the DEIS. In fact the DEIS is defective in that it did not answer the individual issues brought up in the scoping hearings, as mandated by NEPA. Uranium is in the bedrock throughout Arizona, which presents a unique challenge to mining here. The danger is so significant that when the Washington D.C. office of EPA published a report in 1999 on the health hazards of Technologically Enhanced Naturally Occurring Radioactive Materials (TENORM) [ http://www.savethesantacruzaquifer.info/EPA%20TENORM.pdf ], they used only Arizona mines as their examples—including Cyprus Sierrita, Twin Buttes and the Cyprus Tohono mines in this region. All three are now/are have been under Superfund actions for having polluted the groundwater with heavy metals and/or radioactive chemicals produced in mining operations. Tailings impoundments and rock stockpiles may contain sulfide minerals that can react with storm water runoff to potentially impact surface and groundwater. To protect surface and groundwater for future generations, we may cover these sites with soil, promote vegetation growth, and manage storm water runoff. Under some conditions, well designed reclamation projects can also provide opportunities for recreation, wildlife habitat enhancement and renewable energy projects. The fungus that causes valley fever, Coccidioides immitis, thrives in the alkaline desert soils of southern Arizona, northern Mexico and California's San Joaquin Valley. It's also endemic to Utah, Nevada, New Mexico, Texas and parts of Central and South America — areas with mild winters and arid summers. The first case of valley fever was recognized more than a century ago. Since then, doctors have diagnosed upward of 100,000 cases a year in endemic areas. But starting in the 1990s, the incidence of valley fever increased significantly, especially in California and Arizona. A number of factors seem to have contributed to the rise in reported cases — up more than threefold between 1993 and 2003 in Arizona alone. • Climate change. In desert regions, changing rainfall patterns and extended periods of drought seem to be closely associated with the upsurge in valley fever. Coccidioides, dormant during long dry spells, "blooms" when it rains and is swept into the air by anything that disturbs the soil: earthquakes, storms, farming, construction. In Arizona , most outbreaks occur in June, July, August, October and November. • HIV/AIDS. People with severely compromised immune systems, especially those with advanced AIDS, are at great risk of disseminated valley fever. As people live longer with AIDS, and as they relocate or travel to endemic areas, the risk of serious infection increases. Valley Fever symptoms reported cases in Arizona continue to rise dramatically, up almost 365 percent over a 10-year period, to 2,695 in 2003 from 580 in 1993, according to the state Department of Health Services. Through July of 2004, 2,040 Valley Fever symptoms cases have been reported statewide. More alarming, Valley Fever symptoms rates rose almost 226 percent in the same period, to 47.9 cases per 100,000 Arizona residents in 2003 from 14.7 cases per 100,000 in 1993. Health officials say the increases may be due to Arizona's drought, construction boom and growing population of susceptible newcomers. Mining in a National Forest poses a threat for forest fires. The industrial operations include a lot of welding on equipment, including truck repair. 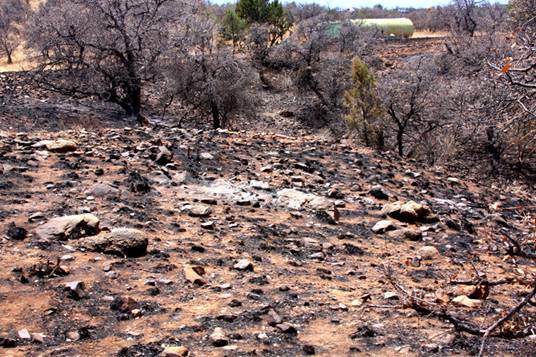 The blaze can spread rapidly, especially in the drought prone and windy southwest. The inhalation of smoke from forests fires is a health hazard. The American Lung Association posts information specifically on the dangers of inhalation of smoke from forest fires. Wildfires are an ongoing concern, particularly in the Southwest and Midwestern U.S., where there is dry, hot weather. During a wildfire, people all over the area may be suffering the effects of forest fire smoke. The American Lung Association urges those with respiratory problems such as asthma, emphysema, and bronchitis and also those with chronic heart disease to monitor their breathing and exposure to airborne matter. If problems develop call your physician immediately.  People living in close proximity to the fire-stricken areas should remain indoors and avoid inhalation of smoke, ashes, and particulate matter in the area. Ordinary dust masks, designed to filter out large particles, will not help as they still allow the more dangerous smaller particles to pass through. Special, more expensive dust masks with true HEPA filters will filter out the damaging fine particles but are difficult for people with lung disease to use. Consult with your physician before using a mask, especially if you have a lung disease.  If you live close to or in the surrounding area, it's recommended that you refrain from exercising outdoors, especially if you smell smoke or notice eye or throat irritation.  Extra precaution should be taken for children, who are more susceptible to smoke because their respiratory systems are still developing and they breathe in more air (and consequently more pollution) per pound of body mass than adults.  When driving your car in smoky areas, keep your windows and vents closed. Air conditioning should only be operated in the "recirculate" setting.  Stay inside as much as possible, with doors, windows and fireplace dampers shut and preferably with clean air circulating through air conditioners and/or air cleaners. Use air conditioners on the recirculation setting so outside air will not be moved into the room.  Due to the higher levels of pollutants in some areas, there is a possibility of experiencing increased symptoms. If you are experiencing symptoms, please try to contact your physician. If you cannot, asthma patients can follow the asthma action plan developed with their physician. Use your peak flow meter if prescribed. Do not hesitate to take your medication, and avail yourself of the full spectrum of medications your doctor has prescribed to you.  If outdoor trips in smoky areas are necessary, breathe through a damp cloth to help filter out particles in the air.  People with asthma should check with their physician regarding any changes in medication that may be needed to cope with the smoky conditions.  If pulmonary symptoms are not relieved by the usual medicines, seek medical attention. Symptoms to watch for: wheezing, shortness of breath, difficulty taking a full breath, chest heaviness, light headedness, and dizziness. If you have any concerns or questions please contact your physician.  If you develop a persistent cough, or difficult or painful breathing, call your physician. The onset of symptoms can appear as late as 24 to 48 hours after exposure and that smoke can remain in areas for many days after the fires have ended.  People with lung or heart problems should avoid clean-up activities and areas where dust or soot are present.  Thoroughly wet dusty and soot area prior to clean-up.  This will help to reduce the amount of particulates becoming air-borne.  Wear an appropriate dust mask during clean-up.  If exposure to asbestos or other hazardous materials are suspected, do not disturb the area. Dust masks do not protect against asbestos. For more information on respiratory health please contact the American Lung Association by calling 1-800-LUNGUSA. On June 29, 2011, two months after the blaze that destroyed 2,000 acres at Rosemont, the Rosemont CEO says a worker caused May 2 blaze. He said welding work done by a ranch hand working for the company accidentally sparked a fire that burned about 2,200 acres near the Santa Rita Mountains in early May. The ranch worker was welding a broken well bracket in the back of a pickup truck in a manner that followed procedures outlined in the ranch operation's permit to graze on federal land, said Rod Pace, Rosemont Copper's president and CEO. The fire started on the company's Rosemont Ranch, which spans about 30,000 acres of mostly federal land in the grasslands and oak woodlands east of the Santa Ritas and west of SR83. May 2, 2011 a fire was started in the Greaterville area by an employee of Rosemont copper. The fire investigation should have been a straightforward short process. The president and CEO of Rosemont copper, Mr. Rod Pace, admitted the fire began by a welder employed by Rosemont. From the information available that welder was working by himself during one of the worst fire seasons in Arizona's history. The report from Rosemont Copper stated that welder was working on a broken bracket at a well site, why did not the welder use the water available to pre-soak the work area. That fire consumed approximately 2200 acres before being extinguished. 1) Current “test plots” at Rosemont show that the reclamation will not be effective. Even with the assistance of University of Arizona providing the mining company various mixtures of grass seeds and regular watering, the test plots are totally bare. 2) I have not obtained any definitive information on the roasting of the molybdenum, whether the roasting will be locally, or not. These roasters were the avenue of fugitive sulfur dioxide releases at the local Cyprus/Sierrita mine. Thank you for your careful consideration of these important issues.